It has often been said that nowhere in the United States can one find a greater collection of magnificent and historic synagogues than on New York's Lower East Side. As the ultimate destination for millions of immigrant eastern European Jews during the late 19th and early 20th centuries, it became the new homeland and hoped-for goldene medinah (promised land) for immigrants fleeing persecution, poverty, and oppression, while struggling to live a new and productive life. Yet to many visitors and students today these synagogues are shrouded in mystery, as documentary information on them tends to be dispersed and difficult to find. 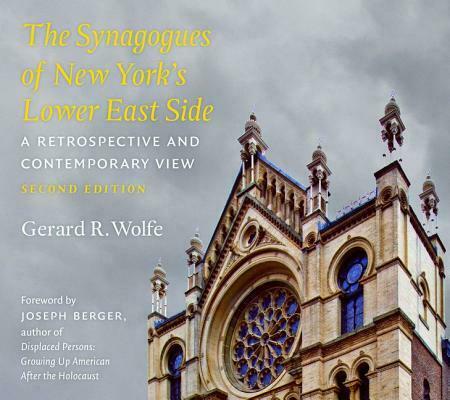 With The Synagogues of New York's Lower East Side, Gerard R. Wolfe fills that void, giving readers unparalleled access to the story of how the Jewish community took root on the Lower East Side of Manhattan. Using archival photographs taken by Jo Renee Fine and contemporary shots taken by Norman Borden alongside his text, Wolfe focuses on the synagogues built or acquired by eastern European Ashkenazi Jewish immigrants during the great era of mass immigration, painting vivid portraits of the individual congregations and the new and vital culture that was emerging. For many, the Lower East Side became the portal to America and the stepping-stone to a new and better life. Today, the synagogues in which these immigrants worshiped remain as a poignant visual reminder of what had become the largest Jewish community in the world. 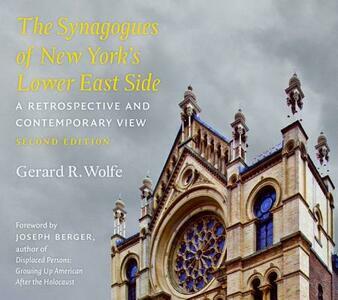 Originally published in 1978, The Synagogues of New York's Lower East Side became the authoritative study of the subject. Now completely revised and updated with new text, photographs, and maps, along with an invaluable glossary, Wolfe's book is an essential and accessible source for those who want to understand the varied and rich history of New York's Lower East Side and its Jewish population. Its readable and illuminating view into the diversity of synagogues-large and small, past and present-and their people makes this book ideal for teachers, students, museum educators, and general readers alike.